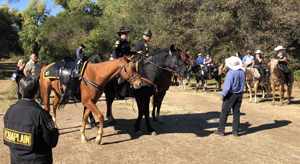 The Law Enforcement Chaplaincy Sacramento (LECS), EIN # 94-2598748, is a 501(c)(3) non-profit, charitable organization committed to serving law enforcement personnel and their families, victims of crime and tragedies, and the community at large. LECS is the only service of its kind that provides 24-7-365 rapid response teams alongside law enforcement agencies with on-scene emotional crisis support. Chaplains are experts in the aftermath of grief and loss. LECS has been named "The National Model Chaplaincy" because of its exceptional organizational structure, its extensive training requirements, and its rapid response capability. LECS Chaplains Academy, which is accredited through the Los Rios Community College, consists of 150 hours of academic classroom and field service training. All LECS Chaplains are background tested, pass two-oral interviews and must agree to continue educational requirements and mandatory group monthly training. LECS serves 15 different law enforcement agencies, state and county government agencies, customer-based retail businesses and various churches throughout the region. LECS provides law enforcement officers and their families with immediate practical guidance, and valuable resources for what happens next. Within Sacramento County, LECS responds to a wide variety of critical incidents, including serious accidents, suicides, homicides or suspicious deaths, sudden infant deaths, barricaded subjects, missing persons, industrial accidents, unexpected natural deaths, death notifications, and many others. Typically, community chaplains are deployed by law enforcement dispatchers within moments of officers' arrival on scene. 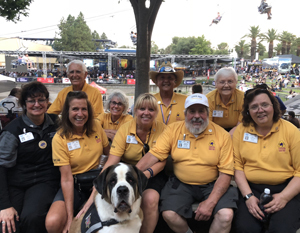 Prevention programs, intervention services and aftermath post-vention services complement the first responder calls within the Sacramento community. LECS serves 16 local school districts within Sacramento County through grants from the Office of Traffic Safety (OTS). 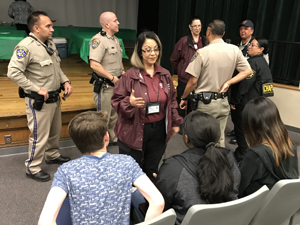 In the Every 15 Minutes Programs, Law Enforcement Chaplains help coordinate the program on school campuses alongside CHP, School faculty, and participating students. Community Chaplains support the event by: contacting parents of the students participating in the program; delivering mock death notifications (together with Law Enforcement personnel) to family members of students participating in the program. Community Chaplains also support the removal of a participating student from the classroom (in conjuction with school personnel) Every 15 Minutes of the school day. A student's mock obituary related to the potential DUI scenario is read to the class by the Community Chaplains. Community Chaplains then assist Law Enforcement Chaplains in conducting an evening retreat and debriefing with the students and parents participating in the program. Finally, Law Enforcement Chaplains and Community Chaplains remain on campus both school days to answer questions and compassionately provide support to any students impacted by trauma and grief. The Law Enforcement Chaplains and Community Chaplains are trained in the effects of trauma, grief, and impacts of shock, and are available to help anyone affected by these events. 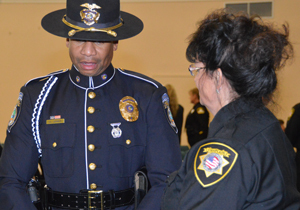 LECS Chaplains are Peace Officer Standards and Training (POST) certified post-trauma and crisis responders. 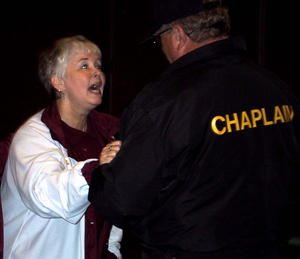 Chaplains are trained in the areas of crime scene integrity, psychological first aid, school crisis intervention, mass casualty evacuation scene support, search and rescue field operations, Town Hall meeting strategies, and Family Assistance Centers' management. May God richly bless you & family! Thank you for all the good things you & Frank & all the chaplains do! Much love & hugs! Chaplain Mindi Russell and her team work tirelessly to assist our communities in amazing ways. Recently, they are helping all the families who've tragically lost in these wildfires... Please consider donating ... Thank you Mindi for all that you do for our community! California State Senator Ted Gaines honoring Chaplain Mindi Russell and members of the Sacramento Law Enforcement Chaplaincy upon their 40th Anniversary! First conceived in 1975 by a group of pastors, business professionals, and law enforcement representatives with the intent of providing ministry support for police and sheriff families in times of personal crisis! Since then, they have come a long ways - now serving 15 local law enforcement agencies, 16 local school districts, as well as state and county agencies! Their role in law enforcement and in the community is huge and vital.